Representative Honours: Ireland: 1 Full Cap (1925); Irish Free State: 1 Full Cap (1927). Club Honours: (with Bo'ness) Scottish League Division Two Champion 1926/27. * Division One appearances (1927/28) only. A then record 41,000 turned up at Windsor Park to witness the international debut of Christy Martin - most of them were to go home disappointed. The match, played in heavy conditions, was comfortably won by a dominant Scotland, and the scoreline could have been much more convincing than the 3-0 eventual result had the Scots turned the screw in the second half. At the time Martin was playing with Bo'ness in the Scottish Second Division, scaring the life out of defences from anywhere on the forward line. His goal tally for 1924/25 was 34 and in 1927 he finished with 29 as Bo'ness claimed the title, and with it promotion to the Scottish topflight for the only time in their history. Bo'ness had plucked Martin from the Glasgow Junior League, one of their regular hunting grounds for new talent, where he had starred with St. Anthony's. 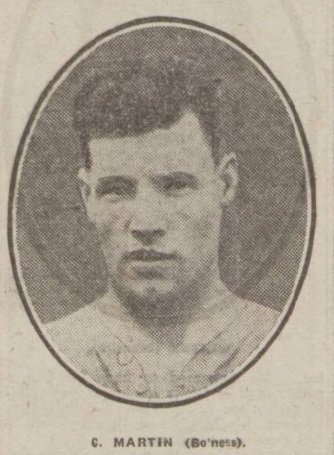 1927 also brought Martin a second international cap, this time as centre-forward for the Irish Free State, in their first ever home match (excluding games played by their Olympic side). The "Free State" had made their international debut a month earlier against Italy's "Full" eleven, a 3-0 defeat in Turin. The Italian FA deemed that a 'B' side would be equal to the occasion, their first eleven facing France in Paris the day before - the visitors accordingly recorded a 2-1 win at Lansdowne Road. It was a shot by Martin that led to the Irish goal - their first on the international stage - with Bob Fullam slamming home a parry by the 'keeper. Bo'ness lasted a single season in the Scottish First Division. With star-man Martin limited to just seven goals from 37 games, they finished 19th and suffered relegation back to Division Two. He briefly played with Falkirk before joining the exodus from the British game to the American Soccer league. 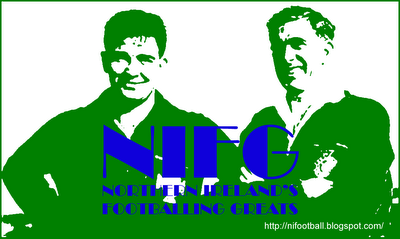 Martin returned to Bo'ness in 1931 for what proved to be their swansong as a Scottish League club. Martin's career was brought to a premature halt by a non-footballing injury, a fractured skull. Summary: 1/0. Won 0, Drew 0, Lost 1. A Christopher Ambrose Martin was born in Athlone in 1901 to Patrick Martin and Kate Murtagh, it is unconfirmed if this is Christy. Christy Martin was my grandfather through my father (both named Chris), he also had five daughters. My father passed away when I was young, so a lot of Mr Martin Senior's history was lost. We have the cap and shirt from the 3-0 loss at Windsor park, my cousin has the other cap and shirt from the Italy game. Outside of an article on that game, and a team photo of the Scotland loss we had little information. This came as a surprise to many in our family, and I would like to find out more if you have any suggestions. I can also say that his career was cut short by a non football injury, a fractured skull stopped him playing. I can provide the team photo of the 3-0 loss, and article on the Italy game if you are interested. I just wanted to thank you for answering a lot of questions our family has had and me personally. I'm glad you appreciated the article. Unfortunately I've really exhausted any specific details I have on your grandfather. I would love to see the photograps and match article if you would like to scan them and email to me at jcd.nifg(at)gmail.com. Newtown Park, Bo'ness, where Christy played is still in use. Bo'ness FC went bust in 1932 and Newcastle United offered to play their reserve team in Division Two in their place. The SFL turned them down. A new club called Bo'ness FC Limited was formed and played non-league senior football till the war. The present club at Newtown Park is Bo'ness United FC, a junior (non-league) team formed in 1945. They have a decent website with photos of the park. Christy's first club, St. Anthony's, are still flourishing. They no longer play at the park he knew (round the back of Ibrox Stadium) having moved a couple of times since then. They now play at Cardonald, about a mile away. The Ants are a friendly wee club and you should definitely contact them via the fans forum on their website. I'm involved in Athlone Town FC and would be eager to hear more about your grandfather's Athlone connections. We would also love to obtain a copy of the photographs of either of Christy's caps. Does the second photo show the Free State strip or Bo'ness? If the former, what is on that badge? The shirt is from Martin's club career. Unfortunately I have no idea what is on the badge as the picture quality is very poor. Tell I lie. It is an Irish Free State kit from a match against Italy 'B' in 1927. Christy Martin was my great uncle as his brother was My Grandfather Michael Martin. I am researching my family tree and trying to find out more about my Grandfathers family in Ireland. I know my Great Grandfathers name was John McDonald Martin, (also my Dads name)I would like to know my Great Grans name to help me in my search. PS.My Grandfather married Bridget Brown in Govan Glasgow Scotland in 1936. Apologies got my great grandfathers mixed up. John McDonald was my grans dad. I don't know my Granda Martins Mum and Dads name but would like to. My Dad and uncles Pat and Mick are also dead so information is limited. My Mum thinks their names were Michael and Catherine bur isn't sure. My Mum says Granda Martin had sisters called Agnes, Catherine and Bridget. Hello relatives of Christy Martin, as a Falkirk FC Fan/Historian I am always looking for info/details on former Falkirk players like Christy. I believe I have found his birth registration in from Athlone, however I am not 100% sure it is the right person. I have a Christopher Ambrose Martin born in Athlone in 1901 of Patrick Martin and Kate Murtagh. Would love for somebody to be able to confirm this.